About a year and a half ago, my youngest cousin Leslie called me up and asked me to be in her wedding. As soon as I had said “Yes”, she told me it would be a Harry Potter themed wedding and that I would be the Ravenclaw bridesmaid. My excitement was immediate for a couple reasons: 1) This fit my cousin very well and 2) This would likely be the last wedding I’ll be in, so the fact that it would be fun and unique was pretty darned cool. I have a habit of spoiling my family when it comes to wedding gifts – For my brother, it was a Playstation 2 (Hey, it doubled as a DVD player, which they did not have!). For my older cousin, Lauren, it was the Anthropologie Lobster dress she lost her mind over when we ducked in the store while bridesmaid dress shopping. For Leslie…. well, in good HannaH fashion, I kept my eye out for the perfect gift, but months and well over a year went by with nothing presenting itself. Last Thursday, two days before the wedding, a friend of mine (Thank you, Michelle!) posted an article on her facebook wall in which a gentleman had made a “pensieve” for his wife as a wedding gift. It was a brilliant idea as a pensieve, in the world of Harry Potter, is a bowl that a wizard or witch would use to view memories, sometimes their own, sometimes the memories of others. It features significantly later in the series. My decision was made. I would make a pensieve for Leslie and Will for their wedding present. While alike in concept, the Brewster Pensieve was quite different from the one in the article. Why? Well, for starters, I didn’t have time to handcraft items or even order them with less than forty-eight hours until the wedding. Also, the pensieve that the article’s author had made was full of his memories of his soon-to-be wife. That’s all lovely and romantic, but coming out of me, that just wouldn’t create the same effect for my cousin and her soon-to-be husband. Some modification was in order to make it meaningful for them. 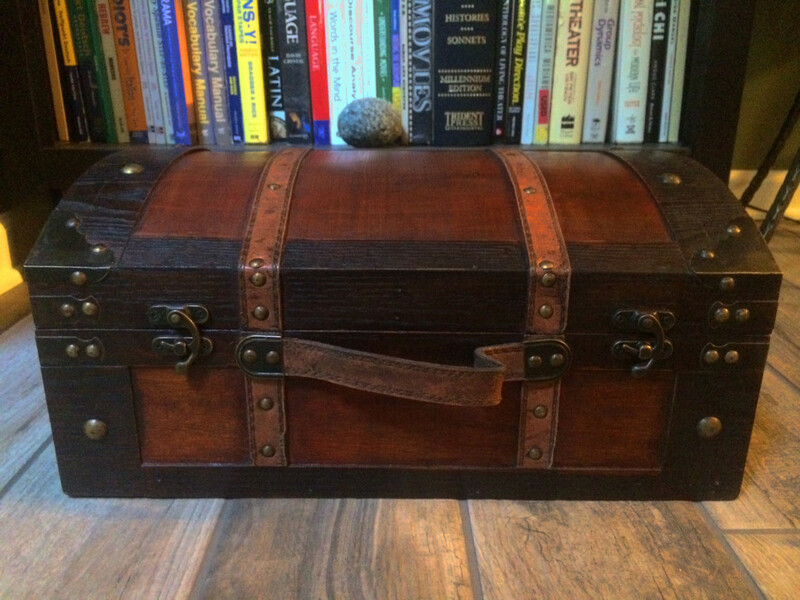 I raided the Hobby Lobby near our house and found an old-looking trunk to hold the pensieve so it could be easily transported and also protected from Leslie’s cats. Actually, all of the materials I used came from Hobby Lobby, except the bowl itself. I found the bowl for about $13 at a nearby Marshall’s HomeGoods. Using a metallic Sharpie, I inscribed the back of the trunk lid with “The Brewster Pensieve”. The bowl went into the center of the case. I lined the sides with glass bottles that had glass stoppers as they appeared more “wizard-y” than those with cork stoppers. I also made a tag for each bottle so memories could be labeled with initials and my cousins would know to whom they belong. 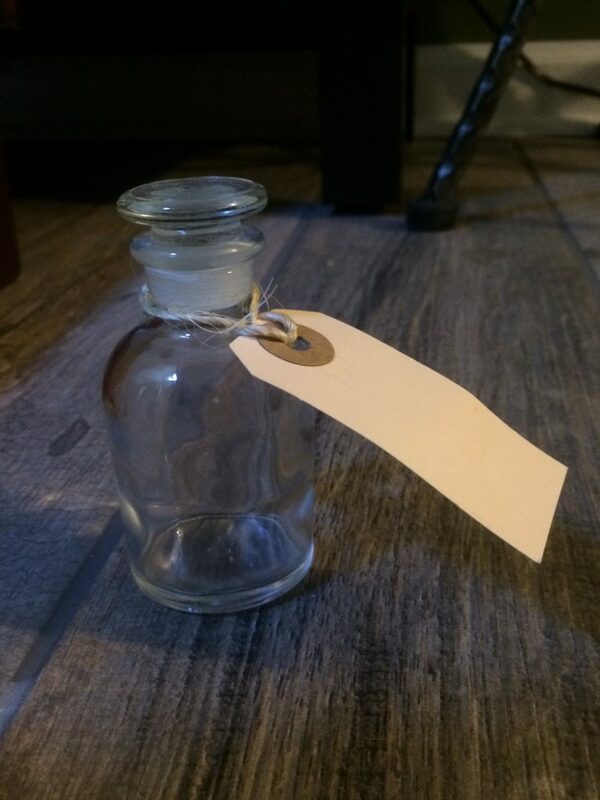 A glass bottle with glass stopper looks rather wizard-y. 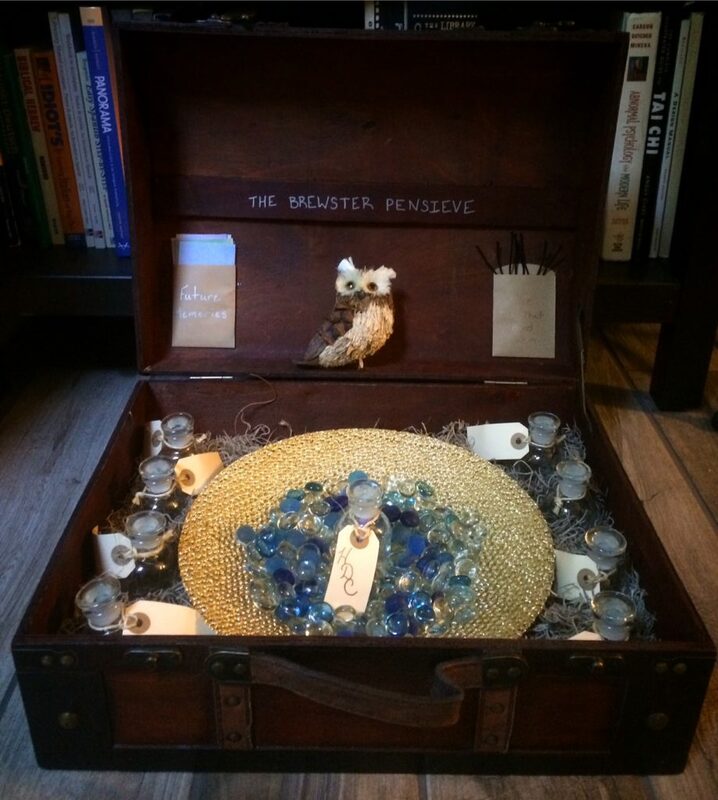 I filled my pensieve bowl with those slightly flattened, glass rocks – clear and blue to represent the water that stays in the pensieve of the books. Spanish moss snugged it all into the trunk. It all fit nicely into the trunk. If my mother-in-law has taught me anything (Actually, she’s taught me a great many things. ), it’s that hot glue is a crafter’s best friend. 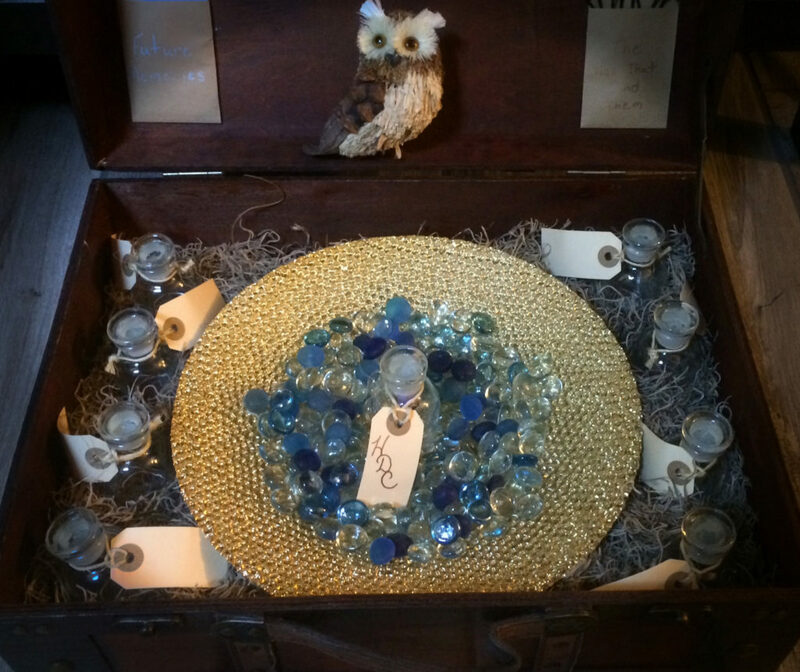 I secured a little owl in the lid of the trunk with the hot glue and glued little brown envelopes to the lid as well, to hold the items needed to store more “memories”. A cute owl and brown envelopes to hold supplies for storing memories. For the final touch, I started them off with a memory of my own – one of them together at our grandparents’ Christmas event. 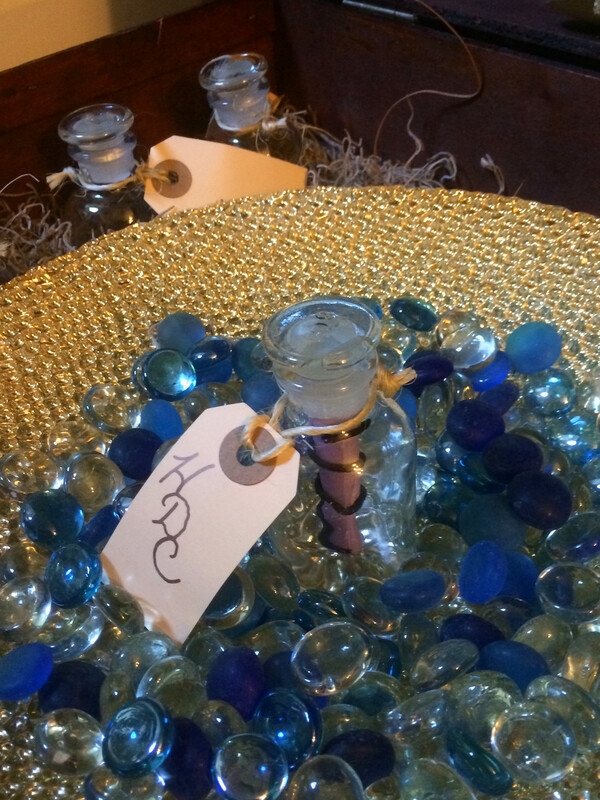 I put this bottle in the middle of the pensieve and added my initials to the tag. The “memories” are just colorful cardstock written or drawn on and scrolled up, and I wound some flexible jewelry cord around the one I contributed to keep the little scroll together. I cut plenty of extra pieces of cardstock and cord for them to make their own. As you look forward to your life together, treasure the memories that brought you here. While love is certainly the greatest magic, hope and strength are what carry us through hard times. Hold on to your memories, for they are your greatest source of hope and strength when times are darkest and all other lights go out. We (Mike and I) gave it to them at the rehearsal dinner. It was a huge hit, Leslie squealed, and it even found a place on the Memories table at the reception the next day. While I hadn’t even considered it being part of the wedding decor when I began the project, it really found a perfect place amongst pictures of loved ones that have already passed on. 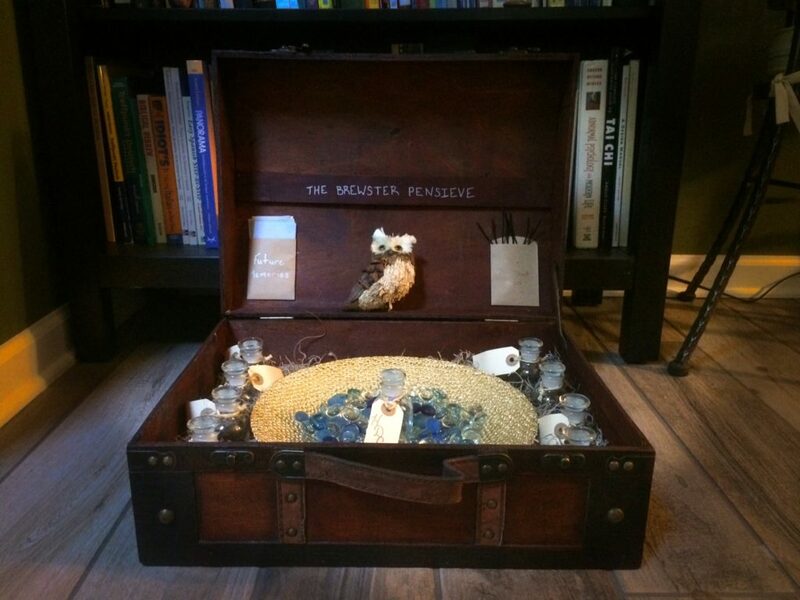 So, The Brewster Pensieve goes down as one of my most successful gifts ever, and that magic makes me smile too. 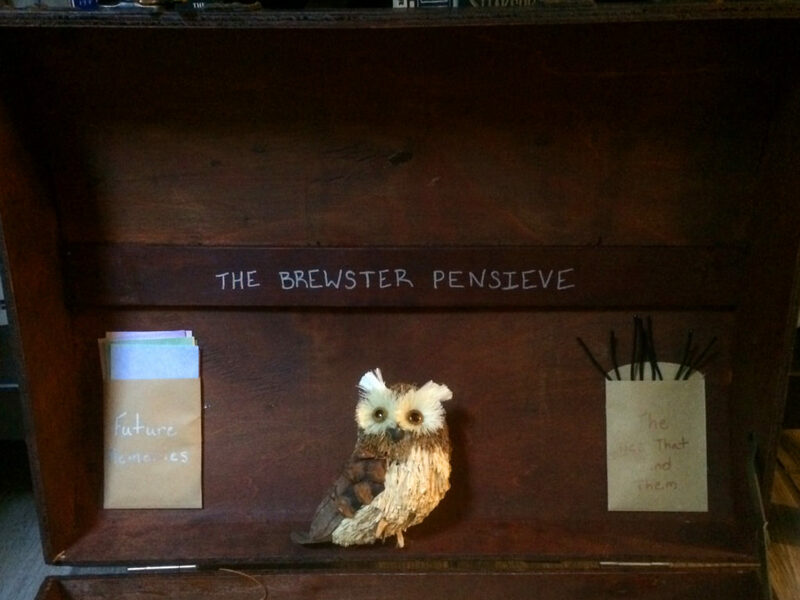 6 Responses to "The Brewster Pensieve"
So creative…as you always are! Totally awesome. I love it and the thought behind it! !